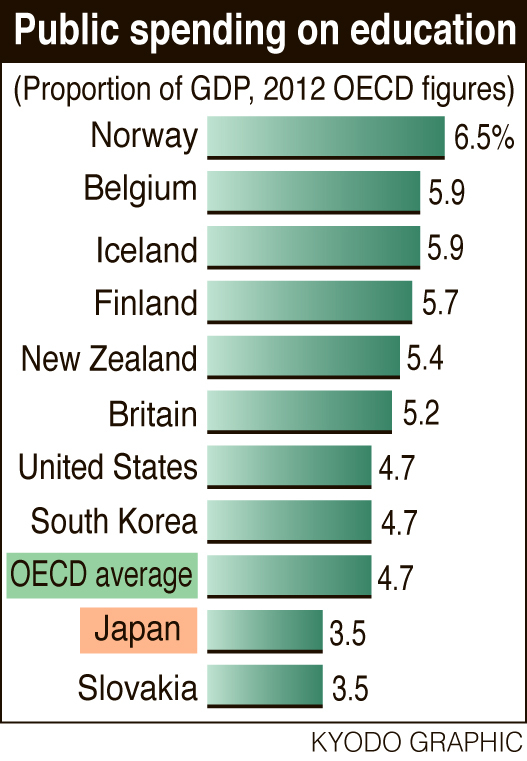 Japan’s public spending on education as a percentage of GDP was the lowest among the OECD countries in 2012, marking the sixth consecutive year that the nation was saddled with the ignominy of being the stingiest spender, the group’s latest report on education shows. Education at a Glance 2015, released by the Paris-based economic institution on Tuesday, found that, in a category covering education all the way from primary school to college, Japan’s public spending amounted to just 3.5 percent of its GDP. That was the lowest percentage among 32 of the 34 OECD members where data were available, sharing the bottom spot with Slovakia, against an OECD average of 4.7 percent. Norway emerged as the largest educational spender in relation to its GDP, at 6.5 percent. Belgium and Iceland followed with 5.9 percent. Figures for Denmark and Greece were not available. The report also highlighted the scarcity of public support for college-level education in Japan, with only 34.3 percent of higher education costs in 2012 being supported by public sources, compared with the OECD average of 69.7 percent. This was the second lowest in the OECD, followed only by South Korea, where just 29.3 percent of tertiary education costs were covered by public sources. The report also reflects the increasing demands the nation’s teachers face. Teachers in Japan are having to deal with more students in classes, with the average number per class in national and municipally run elementary schools being 27 in 2013, the third highest among OECD members and higher than the average of 21. At junior high schools in Japan, the average class size was 32 — the second largest in the OECD — and also higher than the average of 24. Despite this, teachers’ salaries in Japan declined by 6 percent in real terms between 2000 and 2013, while countries such as Norway, Australia and the United States logged positive growth in teachers’ pay during the same period. 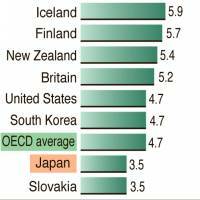 The OECD report also points to a huge gender gap in information and communications technology (ICT) skills in Japan.